This list provides an overview of books about lieder, art song, etc. More Than Singing. Lotte Lehmann. Dover Publications. 1985. ISBN 0486248313 (paperback). Eminent soprano's inspiring discussions of lieder by Schubert, Brahms, Schumann, Haydn, Beethoven, R. Strauss, other masters. Forword by Bruno Walter. 192 pp. Voices of the Plain. Gregory Myers. Vox Bulgarica Music Publishers. 2000. ISBN 9549058557 (paperback). 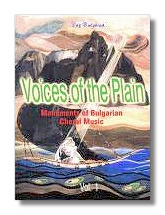 A deluxe 2-volume anthology of the best of Bulgarian choral music. Collaborators include the composers and their heirs, Bulgarian Radio, and the Composers' Union. The volumes make available for the first time the most famous numbers found on the CD series, "Les Mystères des Voix Bulgares," (the folksong arrangements of Kaufman, Koutev, Kiurkchiiski, Liondev, Strefanov and Tchapkanov), along with the best and most representative monuments of Bulgaria's choral avant-garde (Spassov, Iliev) and sacred music (Tanev, Tekeliev and Zaimov). All have been prepared in Latin transliteration and English translations, with a pronunciation guide, for use by Western choral ensembles. Interested parties should contact Dr. Gregory Myers at ustav@home.com or ustav@shaw.ca. The Fischer-Diskau Book of Lieder: The Original Texts of Over 750 Songs. Dietrich Fischer-Diskau, with George Bird (Translator). Proscenium Publishing. 1984 (Reprint Edition). ISBN 0879100044 (paperback). An essential book for singers and pianists, as well as those interested in lieder. Gives poetic rather than literal translations of songs. 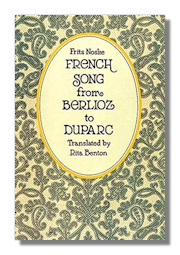 French Song from Berlioz to Duparc. Frits Noske, Rita Benton. Dover Publications. 1988. ISBN 0486255549 (paperback). Meticulously detailed analysis of the rise of the melodie, its adaptation by Berlioz, and its apogee in the songs of Fauré and Duparc. A song catalogue, newly revised and expanded, lists available sources for the concert artist or amateur musician seeking to expand his repertoire. Revised 1970 edition. 250 musical excerpts. Bibliography. The Schubert Song Companion. John Reed, with Norma Deane, Celia Larner. Mandolin div of Manchester Univ. Press. 1997. ISBN 1901341003 (paperback). A wonderful guide to all of Schubert's Lieder, for the student, performer or listener.